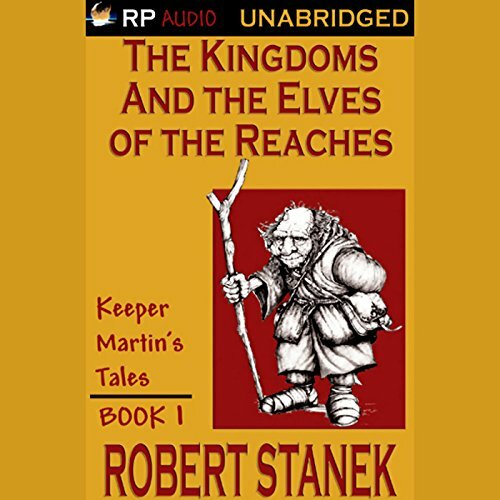 Listen to more books in The Kingdoms and the Elves of the Reaches series. Writers like JK Rowling may get all the ink in the press but there are very few writers of Stanek's caliber. The Kingdoms and the Elves of the Reaches is a wholly engaging story, filled with delightful characters. This book gets everything going and sets up the story beautifully for the sequel The Kingdoms and the Elves of the Reaches II. From the very beginning, the narrator's "middle earth" quasi-English accent got on my nerves, but I listened on hoping for the writing would compensate. The book jumps between three different stories, but none of them are engaging and all of them start off very slowly. Finally, some action and progress occurs later in the book, enough that I can at least justify listening to the rest. But just as each of the three adventures shows that they could start to reach some type of conclusion, the book ends in cliff-hanger, soap opera fashion. There is no finality or even mid-stop conclusion to any of the stories. It simply says "buy book 2". Are you kidding? I thought I purchased an unabridged book in a series, not half of a book with no ending. Seeing that this first book can't stand alone, the existence of "book 2" seems to be a rip-off. At least the abrupt ending gave me a reason to start listening to something -- please, anything -- else. I wish Duane's review had been up when I downloaded this, I wouldn't have wasted my time. I kept checking back on the website to make sure I hadn't accidentally gotten an abridged version because there seemed to be too much missing. I especially found the "transitions" (or lack thereof) to be disorienting since there wasn't even a pause on the part of the reader to indicate the perspective was switching. In fact, I can't believe anyone praised this reader, I found his narrative to be monotonous and annoying. The characters were uninteresting, and if there was a plot to this I totally missed it. Luckily it was short; it was relief when it was over. I have no interest in finding out what happens next. I still think somehow I got the wrong book. When a book wins as many awards and accolades as these books have, you know they're pretty good, and they are. The writing throughout the series is a sheer delight. The reading is superb as well, with spot on voicing of the characters and the narrative. Having read all the novels previously with my sons I can honestly say The Kingdoms and the Elves of the Reaches is one of the best things going. Each book in the series is better than the one before. My favourite of all is this one. The sweeping scenes and rich prose make this more than a good book; it is an excellent book. The series is four books. The Kingdoms and the Elves of the Reaches #1, #2, #3, and #4. Don't start if you don't plan on listening to them all, because you won't be able to stop. If you start, you have Edward Tallyback, Erravane Queen of the Wolmerrelle, King's Mate, kingdom trios, the elf queen, king cats, eagle lords, a dragon king, and more to look forward to. With all the dastardly villains and endearing characters, Mr. Potter could find himself with some serious competition. Certainly one of the most richly imagined novels I'm come across in all my years of reading. Full praise to Robert Stanek. Starts simple, but keep going because it picks up in the second one. A must read series. Is this the readers first book? After reading some of the other reviews I was looking forward to hearing this, however I did not get past the first 20 minutes. The reader spoilt the whole experience, either he was being paid a fixed fee, so was doing the job as quickly as possible or it was his first reading role. The experience is that he reads too fast without conveying anything of the text or showing any feeling of the book. He also speaks in a breathless way which is very disconcerting and he his either trying to do a British type accent or a posh American which you spend all your time trying to analyse without listening to the content. Overall a very poor attempt and I have obviously been spoilt before with this being the first time I have had such a bad experience. I cant really comment on the content or quality of the writing as the reader takes your whole attention. This is one of my favourites - I read it a few years ago and loved it then. It is the start of one of the most engaging series I have had the good fortune to read. A must read for all, as it will have something for everyone that reads it, drama, action and a brilliant plot. My sister who had never touched a Fantasy book before got hooked on it when I gave it to her on Holiday. She's read all four now. To get the whole experience you have to read at least books one and two. Did the narrator do a good job differentiating each of the characters? How? I found the narrator irritating: something about the inflection seemed to be very repetitive. OK, maybe this picks up after a while, but I listened to the first hour and then gave up, it was just too much effort. Given the other good reviews, maybe I should read the book rather than listen to it. The other reviews seem to be talking about 'reading' the book, rather than listening to it. It just seemed too complicated a book to listen to, so I couldn't grasp what was going on. I didn't find the narrator that easy to listen to either. I may see if I can find a copy of the book (paper version) in a library to read to see if that's OK, as it seems to be easier to understand books with lots of detail in their plots when you can go back and look at things again and so on.